This tattoo is a Surrealism style tattoo idea. The artist has used extreme expertise to transform the arm into appearing textured like wood. The sleeve features demon animals and swords battling through winding designs. The outer arm features an extremely realistic angel with detailed wings looking down over an orange burst surrounded by skull patterns. 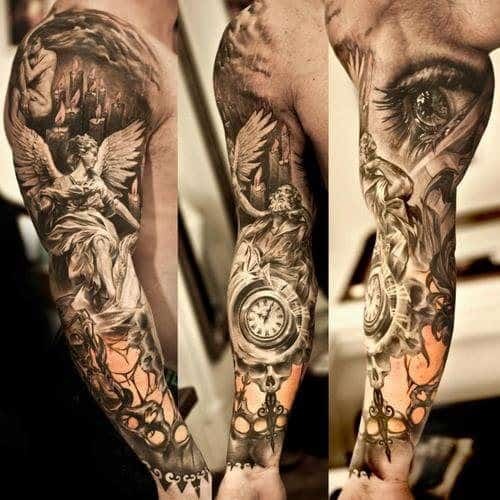 The inner arm is adorned with a very large, stunningly realistic eye, and a smaller, whirling clock of roman numerals. 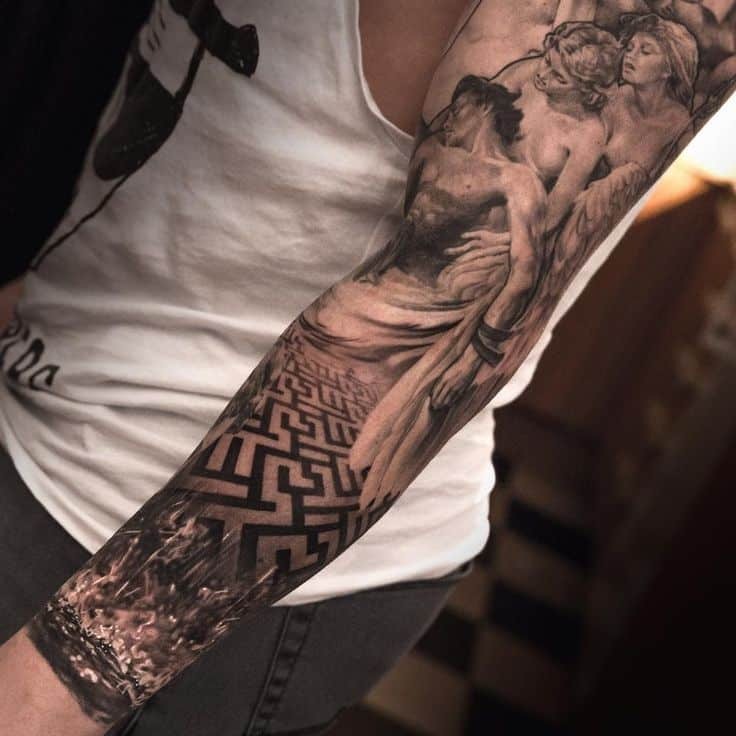 The left arm is a great example of Blackwork style tattoo ideas for men. It showcases a forest of solid black pine trees circling around the lower arm. On the right arm is a swirling, mystical patterned sleeve of black and white. The top of this sleeve features geometric trees criss-crossing in solid Blackwork style. 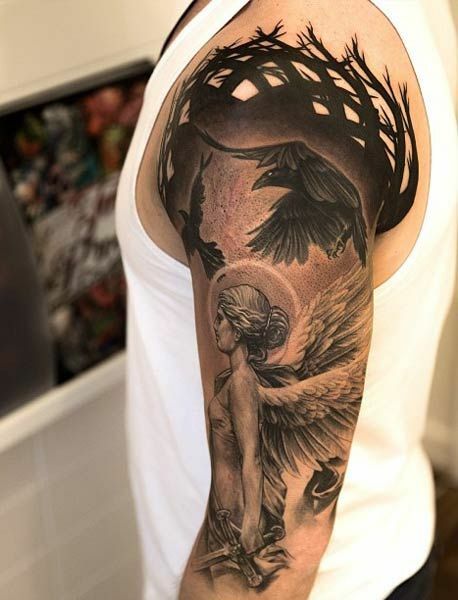 Detailed ravens flap their wings above a realistically shaded angel. Dotwork fills in the background and completes this tattoo idea. This American Traditional style sleeve is comprised of several ornate Mardi Gras skulls, an angry-eyed owl, the traditional style of naked tattooed woman, diamonds, and stars, and is held together by shaded abstract work. 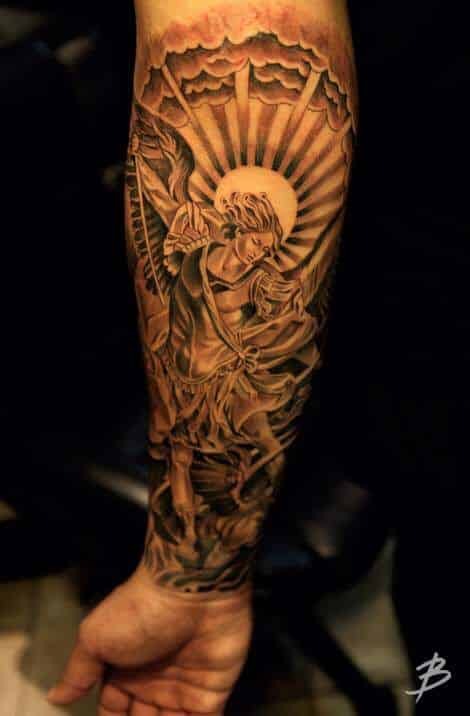 An angel bursts from the clouds in rays of light in this inner arm tattoo idea. The light beams reach from her center to both the wrist and the elbow. This tattoo is expertly shaded and detailed in Illustrative style. This New School style sleeve features a giant, scaled bird that stretches above a snarling, Chinese whiskered dragon. The scales are extremely detailed with well-shaded patterning. Swirling bursts of shadow finish off this black and white tattoo idea. The Blackwork sleeve covers the entire arm. It combines graphic influences with tribal mystique. The main theme is triangles. Various asymmetrical, well shaded patterns stretch from the wrist all the way up onto the pectoral muscle. This tattoo epically combines three styles of work: Pastel, Surrealism, and Illustrative tattoo ideas. A flaming sea done in Pastel style circles the wrist. A trippy maze pays homage to Surrealism, and fades into an Illustrative depiction of two angels mourning over a third fallen angel. 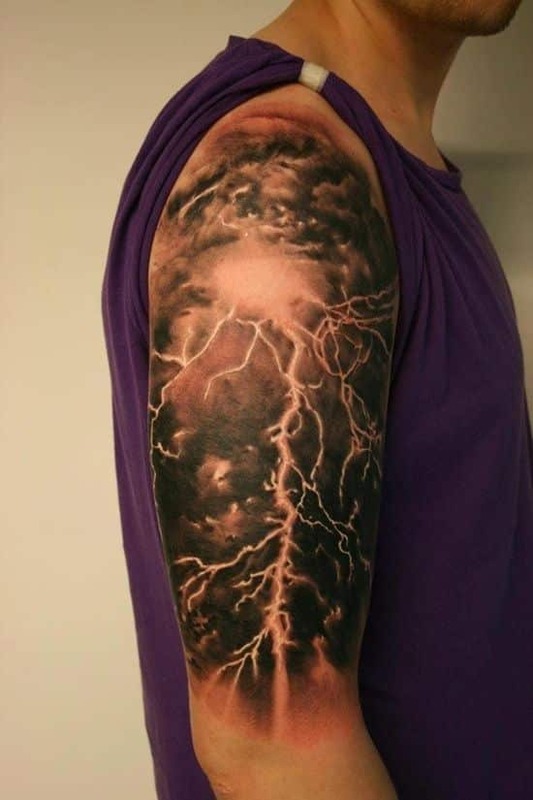 This lightening design is an excellent Illustrative styled tattoo idea for men. The upper outer arm is rocked by a huge shock of white lightening surrounded by a sky of splintering black and red.